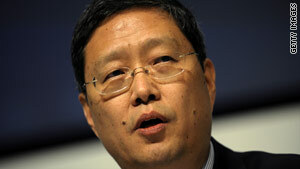 Chinese Vice Foreign Minister He Yafei says the U.S.-Taiwan arms deal "severely" endangers China's national security. China also summoned U.S. ambassador Jon Huntsman to express its anger over Washington's announcement, the official Chinese news agency Xinhua said, citing the Foreign Ministry. Beijing also suspended plans for visits between the Chinese and U.S. militaries and postponed a high-level arms control meeting, it announced Saturday, following Washington's $6.4-billion arms deal with Taiwan. China's Defense Ministry said the decision was made "in consideration of the serious harm and impacts on Sino-U.S. military relations" brought about by the arms deal, according to Xinhua. "China will make further judgments as appropriate," Xinhua reported. The deal with Taiwan -- which neither China nor the United States recognizes as an independent country -- does not include F-16 fighter jets, which China has vehemently opposed. CNN's Eve Bower and Charley Keyes contributed to this report.